The band's latest album, Groovin' in Greaseland, was released on Alligator Records on August 18, 2017. At the Blues Foundation's 39th Annual Blues Music Awards, Rick Estrin & the Nightcats won 'Band of the Year', along with 'Song of The Year' (for "The Blues Ain't Going Nowhere") and 'Traditional Male Blues Artist' (Rick Estrin). You Asked For It...Live!, was also released on the Chicago-based independent blues record label Alligator Records on July 8, 2014. The album is a live recording from Estrin's hometown of San Francisco and featured original Estrin songs dating back to his days as lead singer, songwriter and harmonica player of Little Charlie & The Nightcats (featuring Little Charlie Baty on guitar). Rick Estrin & The Nightcats released their debut recording Twisted in 2009 and One Wrong Turn in 2012, both also on Alligator Records. Estrin was born in San Francisco, California in 1949, and fell in love with blues after his sister presented him with Ray Charles’ The Genius Sings The Blues when he was 12. He began playing harmonica at age 15, and by age 18 was beginning to work professionally. Early in his career he played with Lowell Fulson, Z.Z. Hill, Travis Phillips, and Fillmore Slim.Estrin names Sonny Boy Williamson II, Little Walter Jacobs and Baby Boy Warren as key inspirations. He played with and was mentored by Rodger Collins (whose 45rpm recordings include "She’s Looking Good" and "Foxy Girls" In Oakland). Estrin moved to Chicago when he was 19 and worked with bluesmen Sam Lay, Johnny Littlejohn, Eddie Taylor and Johnny Young. He met and sat in with Muddy Waters at the Sutherland Hotel in Chicago. He told the Sacramento Bee, “Muddy started shaking his finger in my face and said, ‘You outta sight, boy! You play like a man! I know that sound. That’s my sound.’” Muddy tried to hire Estrin as a sideman but Estrin did not receive the phone call, and moved back to the Bay Area. He met guitarist Charlie Baty in 1973 and they created Little Charlie & The Nightcats based in Sacramento, CA. Estrin fronted Little Charlie & The Nightcats for 30 years and performed around the world. They were nominated four times for the Blues Music Award for Band Of The Year. In 2008, Baty retired from touring. Guitarist Kid Andersen joined Estrin and previous band members Hansen and Farrell and they formed Rick Estrin & The Nightcats that same year. Norwegian born Alexander Pettersen joined the band in 2017 as the drummer. Since its inception, the band has played around the world, including the Notodden Blues Festivil in Norway, the Lucerne Blues Festival in Switzerland, the Caxias de Soul Festival in Brazil, the Monaghan Blues Festival in Ireland, the Efes Pilsen Festival in Turkey, and the Moulon Blues Festival in the Netherlands. In the United States they’ve played the North Atlantic Blues Festival, the Magic City Blues Festival and the Bayfront Blues Festival. 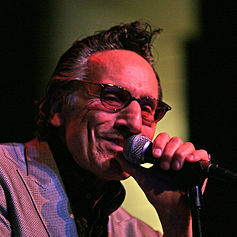 Estrin performed at the Chicago Blues Festival in 2011 as part of the Alligator Records 40th anniversary concert. The band also performed at the Chicago Blues Festival in 2017. ^ "BREAKING: Blues Music Awards winners announced; Taj Mahal & Keb' Mo's 'TajMo' wins seven awards - Blues Foundation". Blues.org. Retrieved 15 May 2018. ^ Lipkin, Marc. Little Charlie Baty of Little Charlie & The Nightcats Announces Semi-Retirement. alligator.com. 01 February 2008. Retrieved 22 May 2014. ^ Lipkin, Marc. Alligator Signs Rick Estrin & THe Nightcats. alligator.com. 03 February 2009. Retrieved 22 May 2014. ^ Lipkin, Marc. Chicago Blues Festival Celebrates Alligator's 40th Anniversary. alligator.com. 30 March 2011. Retrieved 22 May 2014. This page was last edited on 19 November 2018, at 23:38 (UTC).